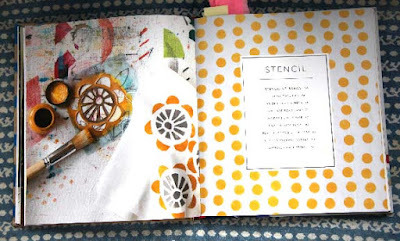 Getting Stitched on the Farm: A Beautiful New Book - Stamp Stencil Paint + A Giveaway! A Beautiful New Book - Stamp Stencil Paint + A Giveaway! Stamp Stencil Paint: Making Extraordinary Patterned Projects by Hand is Anna Joyce's first book. Anna is a successful maker with a popular shop on Etsy. She has been featured in a lot of print and digital design media including SFGirl by Bay and Real Simple Magazine. 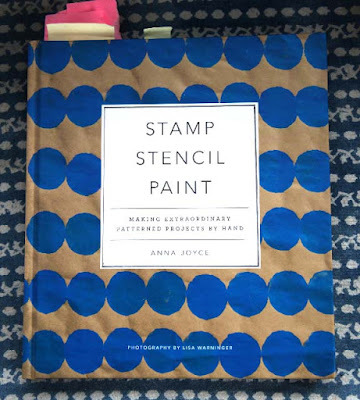 Anna's aesthetic is simple, graphic and modern as you can see by the cover of Stamp Stencil Paint. 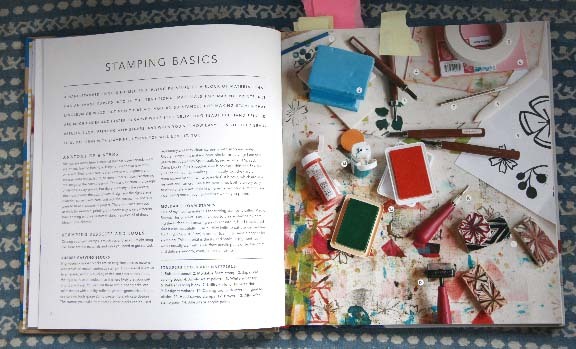 Stamp Stencil Paint begins with a good introduction to Anna's design background and philosophies. Next up, she introduces the supplies, tools and paints she uses. Stamp Stencil Paint is beautifully designed and features photos by Lisa Warninger. It is published by STC Craft and was edited by Melanie Falick. I like what Anna writes in the Getting Started section and I am including it here because I think it explains the aesthetic of the book - including the projects and book design. "Each project in Stamp Stencil Paint was designed to be simple, effective, and deliver great results . For some projects you will need to know basic sewing skills or purchase a few special supplies, but most require just the courage to jump in and get started. You will need to relieve yourself of fear and simply make a pattern, by hand, and I will show you how." After Anna introduces each techniques tools, supplies, and techniques - complete with how-to photos, she includes 7 or 8 projects she made with each technique. Here are my favorite ideas from each chapter. 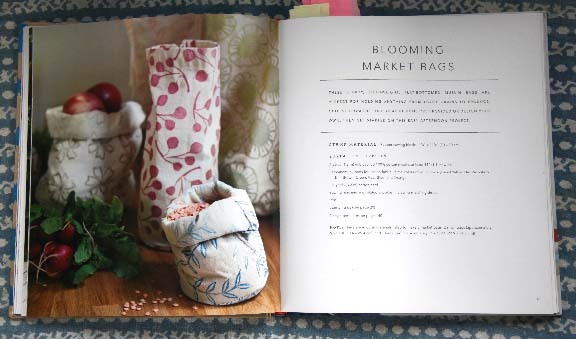 From the Stamping Chapter, these "Blooming Market Bags" look like a quick fun project. Anna includes 6 different floral motif ideas. I think this project would be fun to do with kids or to whip out as holiday gifts. You could also use the motifs on purchased canvas bags. In the Stencil Chapter, Anna includes some more lovely floral projects. 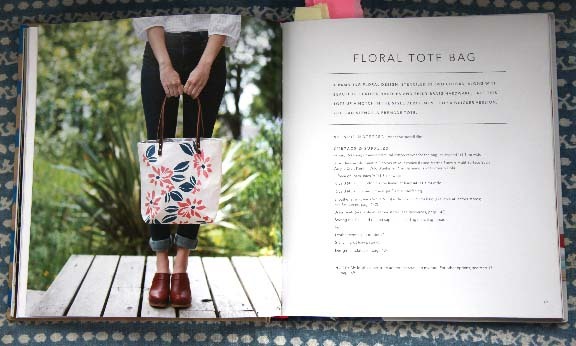 The Floral Totebag has a kind of Hawaiian feel to it. Stenciling is done in two colors. The Bright Table Linens feature a pretty modern flower with Orla Kiely-ish leaves. Anna has designed the stencils so that they are beginner friendly. This design in particular gives a lot of empty space which helps with the stenciling technique which can be a bit fiddly. 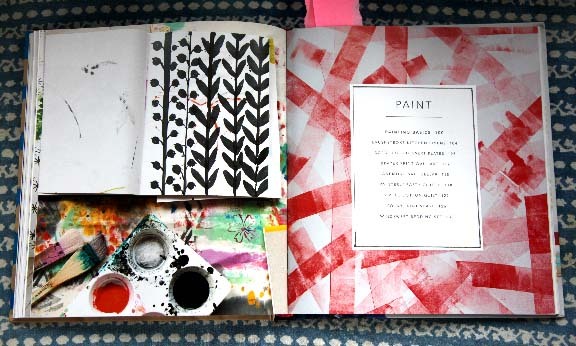 The Paint Chapter is my favorite - probably because the projects are more free-form and loose. 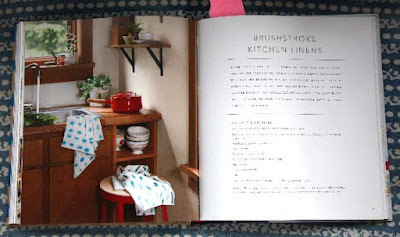 These Brushstroke Kitchen Linens are super simple and stunning. 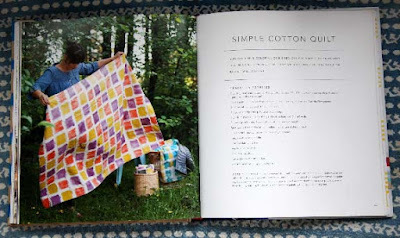 The Simple Cotton Quilt is a bigger project but offers tons and tons of possibilities when playing with color. I love to play with blocks of color and I can see this project as a super fun learning experience. Lastly, Anna has included painting on ceramics. She gives the supplies you will need to produce handpainted ceramics on plates and this salt cellar. The paints she recommends are for porcelain and do not need to be fired in a pottery kiln. Nice job Anna! 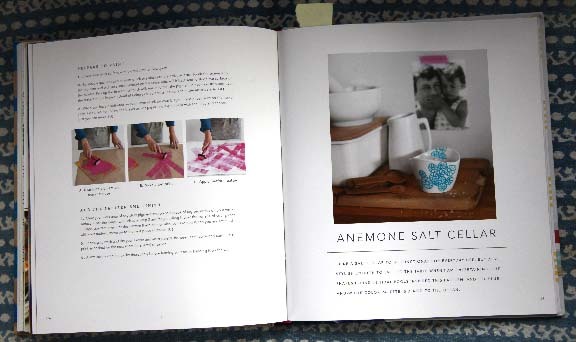 I hope you all will check out this book and maybe purchase it for a crafty friend or family member for a holiday gift. If you were to stamp, stencil or paint - which technique would be your first to attempt? If you have no opinion, share your experiences of a DIY project you have done, or want to do with paint. U.S. Residents only. Contest ends Monday November 16th at 11:59 p.m.
As always, please leave an easy way to get a hold of you - blogger id, email, or Rav id. Thanks for that - it makes running these giveaways so much easier for me not having to track someone down in crazy fashion. I would love to try the stenciling on the tote. I enjoy the projects you have shared by the students of the classes you teach. Wish I lived closer. Thank you for all that you do. I would love to do a quilt, that never came to my mind. I have a reversible ll bean quilt and I have a dog, cat and husband so an extra quilt would be nice. What a beautiful book! I have been really inspired by Natalie Chanin's hand sewing with reverse appliqué lately. I would love to learn more about making my own stencils. I have a couple of carved fabric stamps from India that I'd love to try, one of these days, so maybe I'd do that first. After I finish all the knitting, spinning, weaving, sewing, quilting, etc., I have lined up first! I think I would try stamping first - I'd really like to carve some of my own stamps. And, stenciling would be next. Painting would be harder for me because, as you said, it is more free form and loose and I'm not sure how good I would be at that! Maybe I could learn. . . . .
Hey, I really enjoy your blog! Hoping to make it your Open Farm. My first project would probably be stenciling. As a child, I loved working with stencils having pretty close to zero ability to draw. Thanks for the chance to enter to win! I'm interested in learning to stamp or paint on fabric. I envision making knitting project bags -- I never buy them because I know I could make them myself, but would like to make something really unique. This book looks terrific! I think I would stencil first because it's been something that I've wanted to try but but never really knew how to start. This book seems like a great way to learn some techniques to make me feel confident enough to do it. It'd be either stamp or stencil for me. I'd love to try both on fabric, starting with a tote bag, but if I was any good, it's be fun to create fabric for a summer skirt. My first project would be some form of stencil. I remember doing some of that as a child and it brings back good memories. What an interesting book! I would definitely start with 'stamp'. I have tried to do this technique a little in the past, but would love to learn more from an expert! Thanks! Mamagiff on Ravelry! This looks like a great book. I agree with Cate. I would love to stencil a sheep on a knitting bag. I'm a quilter and I can just picture a stenciled sheep in the center of a quilted bag. I have a sister-in-law who stencils and each holiday season I look forward to receiving her holiday cards. They are each handmade and are always so clever. I'm going to share this blog post with her because she will love this book also. I would love to stamp some fabric to make a tablecloth. I would love to see her method of stamping. (I would like to start there but I would like to try all methods described in her book) I would love to work on fabric because I like to sew .... It would all be designed by me ..how exciting would that be? Stamp! Stencil! and Paint! How wonderful! I've been wanting to stamp and stencil some tiles for our Children's Sunday School area - and this book would be a great impetus to start! From there - it's on to other textile projects and beyond!!! I've always wanted to stencil a border on the walls in one of my rooms! I'd probably start with something simpler like a tote. I have a file cabinet that is waiting patiently for a makeover, this book would go a long way in helping to get that accomplished. Thanks for the chance to win a copy. Kristin, that book looks like a winner. Thanks so much for the introduction. Ages ago, caught up in the spirit of Jocasta Innes' book, I painted, sponged and swirled rosy, creamy colors across the ceiling of my bathroom to creat a permanent sunset sky. I loved it. When I moved, the landlord wasn't so sure about it. However...the sunset wasn't that difficult for him to cover up! Sixty-some years ago in Home Ec class I stamped (something) on fabric which I then made into a dirndl skirt. Boy, did I ever agonize over that project! Decades of crafting have freed up my creative spirit and I no longer feel bound by stamps or stencils so I'd probably paint, freeform; maybe on my drab bathroom wall and ceiling for starters. Looks like an inspiring and fun book. Thanks, Kristin, for your generous giveaways! I have always wanted to create a traditional floor cloth. I love the idea of creating something beautiful that can be used and appreciated everyday. I would try the stencil technique first, as I have done wall stencils in the past. Then I would definitely move on to stamping and painting. I'm not confident that I can do the painting, but I would definitely try it. I love your blog and your enjoyment of color usage. When I start projects, whether decorating, knitting, sewing, etc., it's all about color choices for me. Thanks for all that you give us in your writing! What lovely ideas. I think the 'market' bags that are stamped would be great gifts for Christmas. And could be pre-filled with a bottle of wine or baked goods. Stamping, I think. All of my friends are tired if my plastic bags and want to see actual project bags! Ohmygosh - stamping was a secondary passion to knitting about 8 years ago. I would love to reginite this craft while try out some of her techniques - stamping color designs on paper cards and fabric items like project bags, aprons and totes. Thanks for the opportunity to win the SSP book! ~ I would like to try stamping on linens & fabrics, with perhaps adding embroidery. I'd like to use the stamped designs to make pillow covers, mini table linens & doll clothes for Waldorf dolls, and children sized napkins. 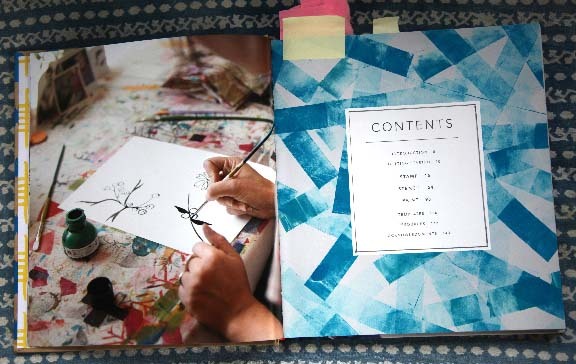 What an inspiring, beautiful, artsy book. ~ Thank you for featuring it, Kristin. Its on my wish-list! 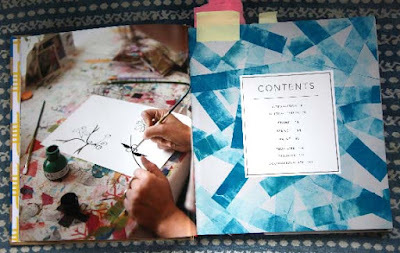 I like to put together my own notebooks and journals with all kinds of paper, book pages etc. It would be fun to add stenciled pages to them. I've been a follower of your blog since recently reading your lovely book. I would love to try my hand at the quilt. I know it's a big project but winters a long season. Thanks. I'd like to try the painting...probably on a tablecloth or pillowcase. I've never tried something so freeform! Thank you, Kristin, for hosting this giveaway. 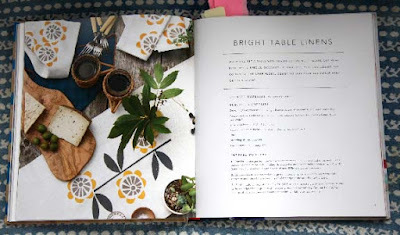 This looks like a fun book that would complement your fabric class nicely! I recently purchased a queen sized down comforter and really, really need a duvet cover. I can't find what I want. Making one and stamping it like the simple cotton quilt would be great fun! Would love to stencil fabric! What a great book and giveaway, thanks!! I would probably try stamping fabric first. I love to make my own stamps, but generally just use them on paper. Looks like a great book! I think I would try stamping. I am a painter and a painting conservator. I am sure I could master stencilling, but I love pattern and plays on pattern and there is something so charming and free about the possibllities of stamping that it really appeals to me. I have done many types of crafts, but have never stamped on fabric or done quilting. I'd love to learn from Anna Joyce's new book.